This week, NYC Swim published a "Swimmer of the week" feature in their newsletter, focusing on me! The journalist, Elaine Kornbau Howley, was great fun to talk to over Skype, and I think she did a great job in the article, which you can find here. Thanks Elaine! This issue included two articles which involved input from the research. 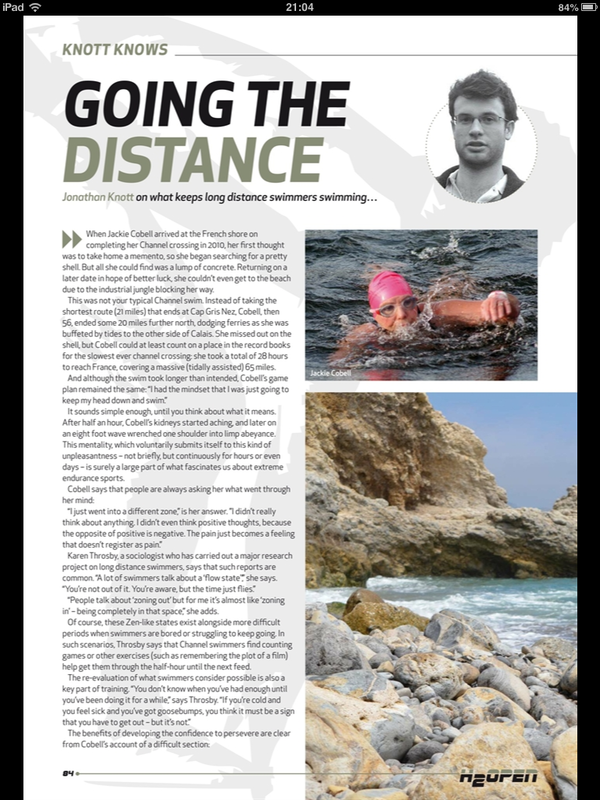 The first is entitled "Going the Distance" (by Jonathon Knott) and involves comment from the research on a number of issues to do with motivation (plus my favourite post-Catalina swim picture). You can download screen shots here of page 1 and page 2. The second article is called "Reveal yourself" (by H2Open editor, Simon Griffiths), and is a lighthearted look at the debates around what constitute appropriate swimwear for men. I had never really thought about the before, but I was able to contribute some of the observational data about how people behave on the beach. You can download the screenshots here of page 1 and page 2. Following a talk at the Wellcome Collection event, Human Limits, my talk was featured in this Guardian Comment piece. I really like the article, but am appalled by the title - I'm hoping that they're going to change it shortly (and I know that the journalist has made the same request). Listen here for a brief local radio interview with Annie Oaten about my successful Catalina Channel swim in July 2011. 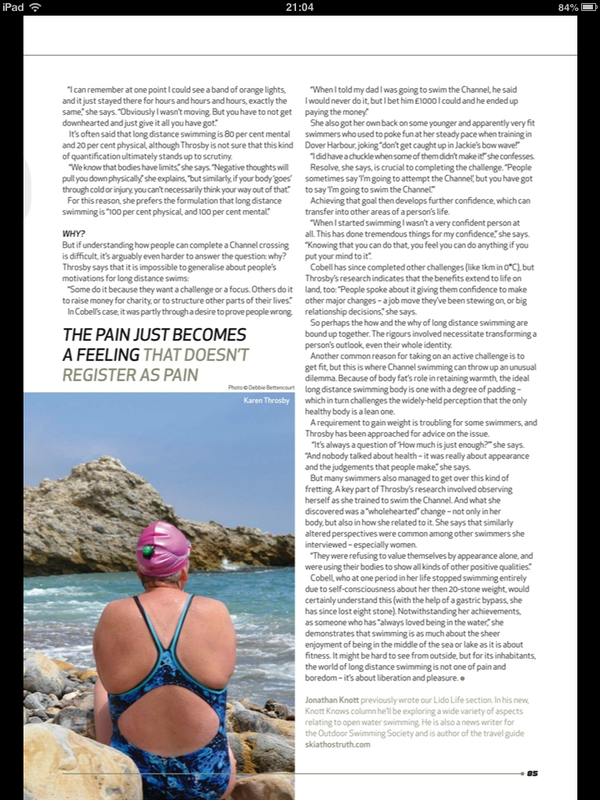 The nice people at H2Open magazine - a new publication specialising in open water swimming - included a nice feature on the research. Click here for a pdf of the article. Listen to a podcast interview with Mark Carrigan, editor of Sociological Imagination - an online magazine exploring the possibilities of politically engaged social science. Listen to an interview on Women and Endurance Sports by Jenni Murray with professional Ironman triathlete, Cat Morrison, and me. Click on the picture for a pdf of the article. You can also find the online version of the article here - and check out the comments from all the angry people who don't seem to like sociologists....or feminists....or swimmers very much! You can find the pdf of a short article on my research project here.